Attracting mellow-minded backpackers to its cheap tents, huts and reggae bar, Lipe Camping Zone is situated off a side lane about halfway between Pattaya and Sunset Beaches. Average rating 6 from 38 reviews. Fronted by a bar sporting Rastafarian flags, musical instruments and a loft strung with hammocks, the Zone’s huts and tents are thrown up around a central table where guests get to know each other. True budgeteers can grab a small tent, while those with a little more to spend might go for a tiny woven bamboo hut with portable fan and mosquito net draped over cotton sleeping mats on the floor. If going with either of these you’ll share a few spartan cold-water bathrooms. The Zone also has a few unusual A-frame bungalows with front and back walls made of bamboo rods and thatch ceilings comprising the sidewalls. These are equipped with proper mattresses on the floor along with bucket-flush toilets in attached garden bathrooms, and you even get some psychedelic art on the walls. While we like the natural feel of the huts, the value is a little questionable when compared to the bungalows at Daya or Cozy Cove, and you may be charged some money to use common electric outlets. If you like the Zone’s funky vibe, you may also appreciate the larger wooden bungalows fetching around 1,000 baht in high season at Lipe Art Garden, which also runs batik workshops just west of Wat Hang Lay near Sunset Beach. To find the Zone you can either walk towards Pattaya Beach’s western end and hang a right past Z-Touch Resort’s ugly orange villas, or head inland and take a left soon after Sunset Beach. 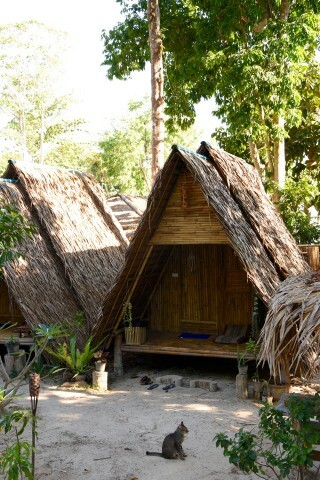 Check rates at Lipe Camping Zone on Booking.com. Room: Tent, low season: 350 baht, high season 350 baht. Notes: Share bathroom.